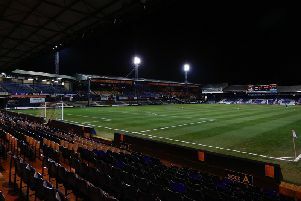 Luton Town are hopeful that defender James Justin’s ankle injury isn’t quite as bad as first feared. The teenager was stretchered off just after the hour mark in today’s 3-1 win over Morecambe and looked to be in a bad way. receiving oxygen with his right ankle strapped up. Speaking to the press prior to the announcement, Town chief Nathan Jones had been hoping for good news, saying: “It’s sad for the boy because he’s been in wonderful form. “It’s his ankle ligaments we think, so we’re just going to have to have a look at that. “It’s just sad as he’s been in such good form, he really, really has, but we’ll assess it and have more news in time. “He’s still only 19 years of age but what a player and it’s just frustrating. "So if he does have to miss a little spell, we’re just hoping its nothing serious firstly and then secondly we’re hoping we can get him back in eight days time. “It’s been his real breakthrough year and he’s been excellent throughout the year. Meanwhile, fellow goalscorer Isaac Vassell said: “I think he’s just landed funny on it, it seemed like it was very painful to him. “I’m not sure what’s going to happen with that one, hopefully it will be a speedy recovery because he’s a vital player for us. “He’s had such a great season and it’s never nice to see someone go down injured, especially him. Fellow full back Stephen O’Donnell performed admirably in Justin’s place after replacing his team-mate, playing a part in Marriott making it 2-1, as Jones added: “That helps us with the squad we have, with the competition we have that we can have people like that who can come on. “The people we have in the squad, would get in a lot of sides, it’s wonderful really.